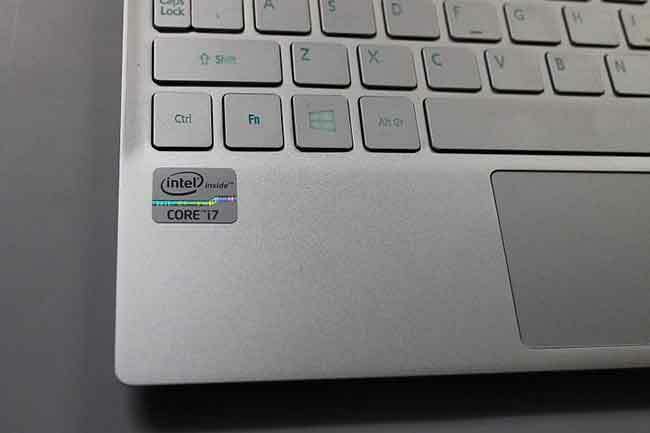 After two waves of ultrabooks that featured Windows 7, the third wave is upon us, one that combines Microsoft’s shiny new Windows 8 operating system with Intel’s 3rd generation Ivy Bridge chips. 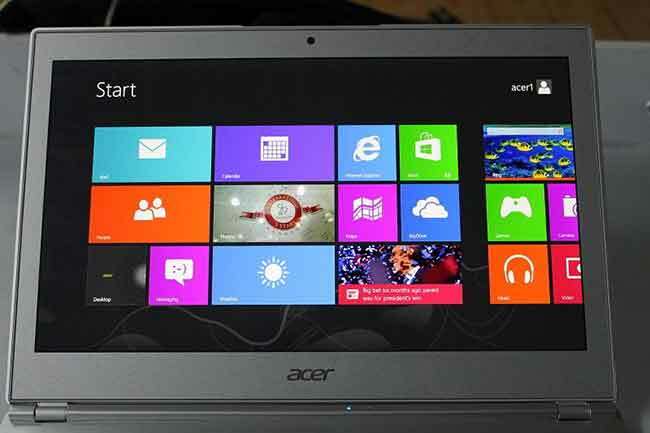 Hardly a fortnight after Windows 8’s official launch, Acer has sent our way its very first Windows 8-ready ultrabook, the slim and beautiful Acer Aspire S7. 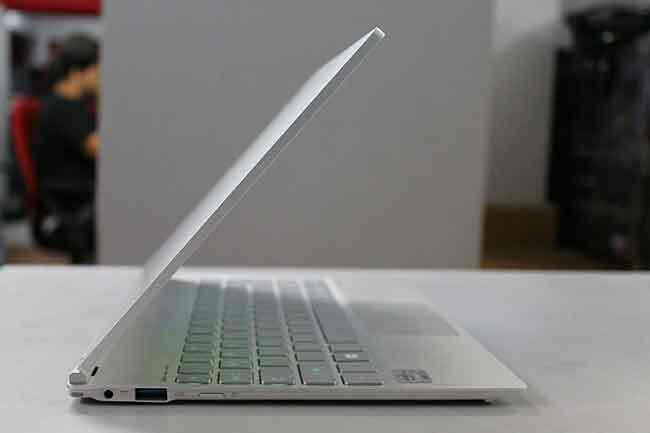 It may well be the slimmest ultrabook around, and while we put it through its paces and work on the final review, here’s our first impression of the Acer Aspire S7. The unit we received for review sports an ultra-low voltage dual-core Intel Core i7-3517U 1.9-GHz processor, 4GB of DDR3 RAM, 256GB SSD (Default RAID 0), and onboard Intel HD 4000 graphics. It came with a portable wireless Bluetooth mouse, additional battery pack, and HDMI-to-VGA and USB-to-Ethernet connectivity cables. It has been priced at Rs. 95,999, and will be available in the Indian market by December. 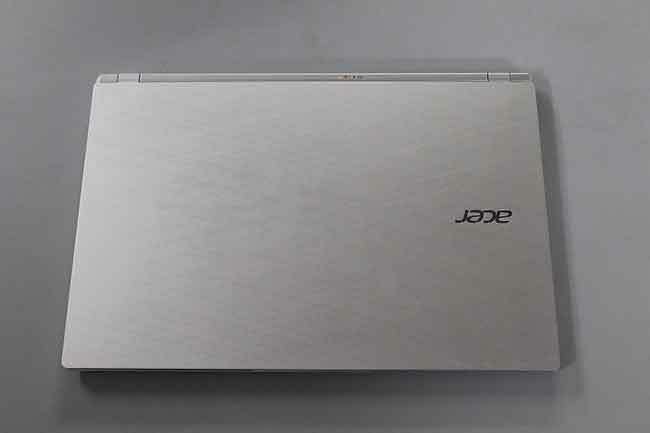 Design and looks: The biggest draw of the Acer Aspire S7 is its beautiful metal body. 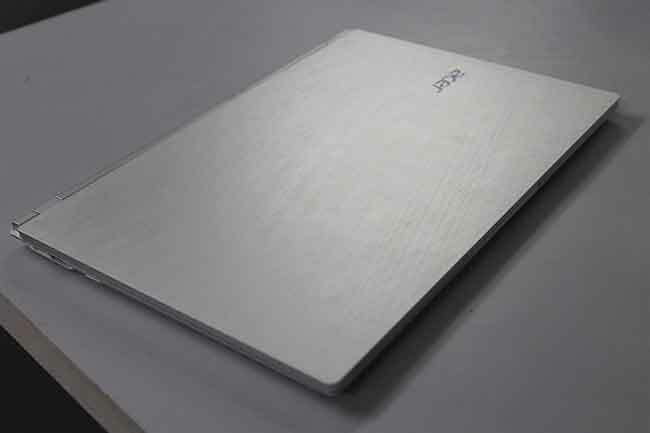 Sporting a silver brushed aluminium finish on its screen lid, the Aspire S7 is every inch an elegant and exquisite ultrabook, one of the best we’ve come across in terms of look and feel. It’s difficult to not to think of the Apple MacBook Air while exploring the Aspire S7, and we definitely mean it as a compliment. 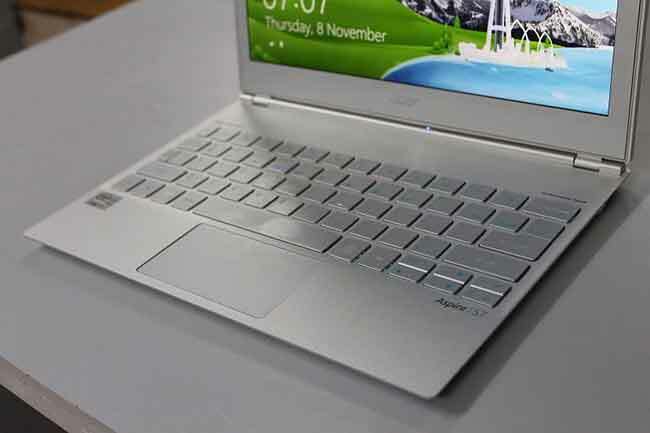 Apart from measuring a few millimetres, the Acer Aspire S7’s thin body weighs just a little over 1 kg! So yes, we are quite impressed by the S7’s thin, bodacious exterior. 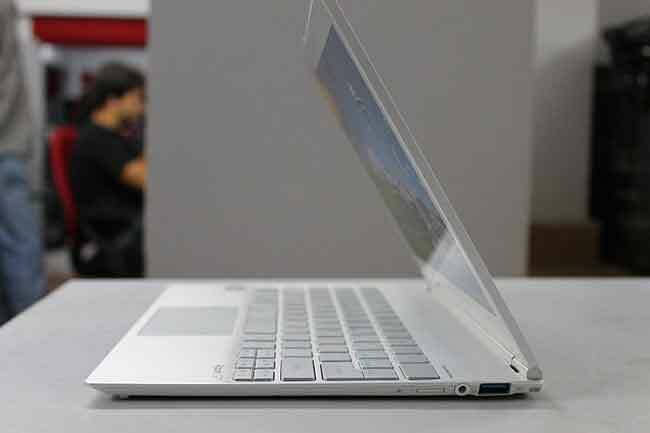 Build quality and form factor: The Acer Aspire S7 is built well, it has solid metal hinges that bring together the 11-inch ultrabook’s screen and rest of the chassis pretty well. Nothing bends or flexes as much on the Acer Aspire S7 compared to laptops or ultrabooks that sport a predominant plastic build. 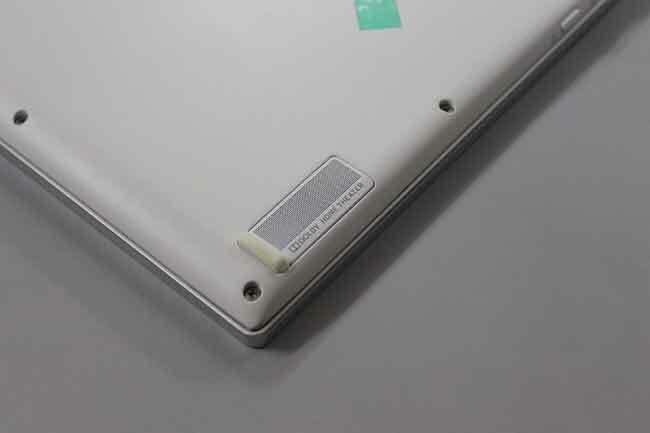 The ultrabook comes with an additional battery strip which plugs into its bottom panel, near the Aspire S7’s spine, giving the machine extra portable power on the go. 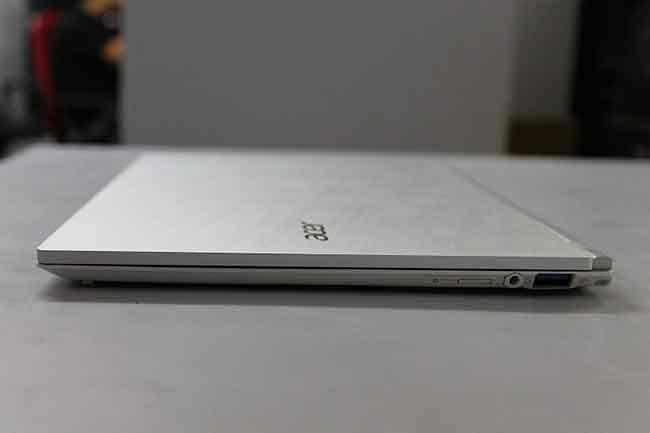 The Aspire S7’s ultrabook has a 11.6-inch screen with a full-HD pixel resolution, which is quite good -- even 15-inch ultrabooks don’t have such high-resolution displays. Even though it’s difficult to read text at native DPI (something that can be easily corrected through Windows’ display settings), Acer should be commended for packing in such a high-res display in the Aspire S7’s tiny form factor. And, of course, the S7’s 11-inch form factor is extremely ultraportable to carry around; the thing can be easily stowed away in your backpack and you won’t even notice it. Keyboard: Keyboard feels a little cramped mainly because of the form factor, but the alpha-numeric keys, Space bar, Alt, Shift, and Control keys are full-sized and easy to press. The feedback on the keys isn’t optimal mainly due to their travel -- the typing experience would’ve been better if the keys were slightly more raised, but we’re just nitpicking here. 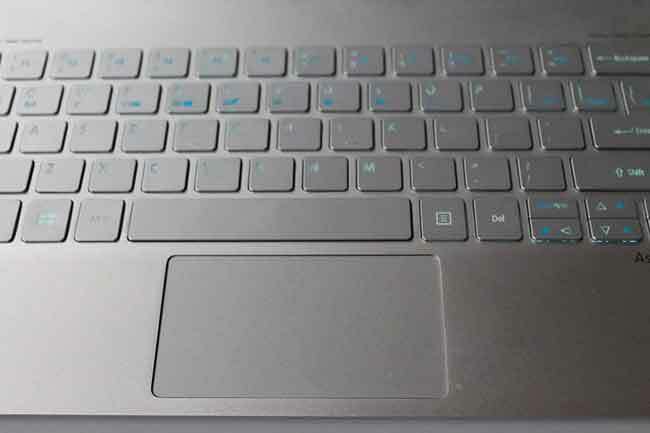 The keyboard is backlit, which helps while typing in the dark. Once you spend some time using this keyboard (especially while typing extensively) you get used to it eventually. 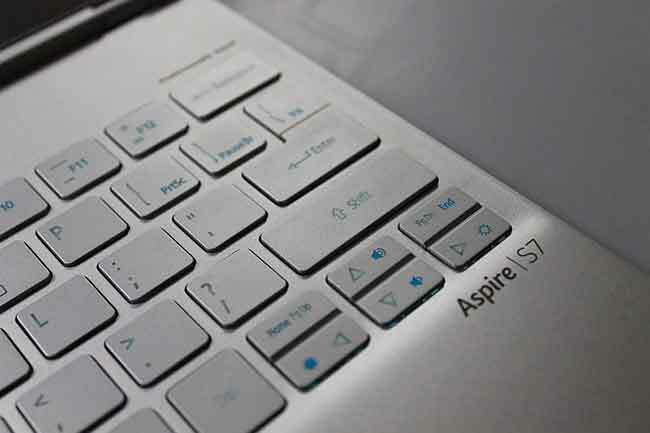 Not the best keyboard we’ve used, but still quite good given the Aspire S7’s tiny form factor. 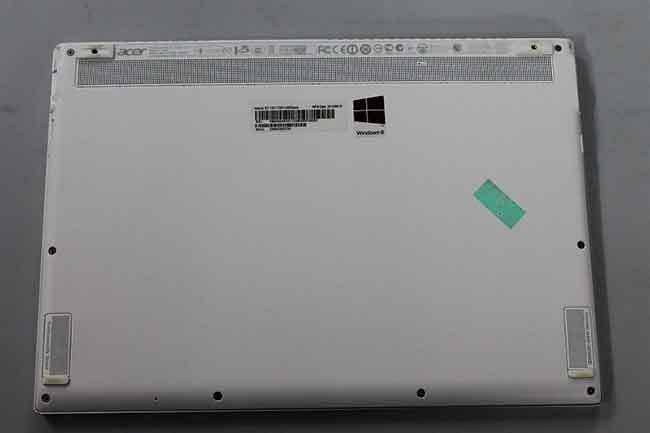 Trackpad: The single-piece trackpad on the Acer Aspire S7 is good to use, it supports multitouch without any trouble. It sits a millimeter apart or lower than the palmrest, functions well and distinctly registers left and right clicks. It’s also gesture-enabled allowing you to scroll, flip through different apps, pinch to zoom, and perform other gestures flawlessly. We also think the trackpad experience on the Acer Aspire S7 has improved a bit over the previous Acer Aspire S3 and S5 ultrabooks. Touchscreen display: The IPS screen with edge-to-edge Gorilla Glass display supports and detects multi-touch input. It’s a capacitive touchscreen with good touch response. The screen isn’t coated with too much gloss which helps keep the fingerprint smudges down to a minimum, which is quite good. Viewing angles of the screen are quite good with just a hint of colour shift at extreme angles, and the screen is nice and bright overall. 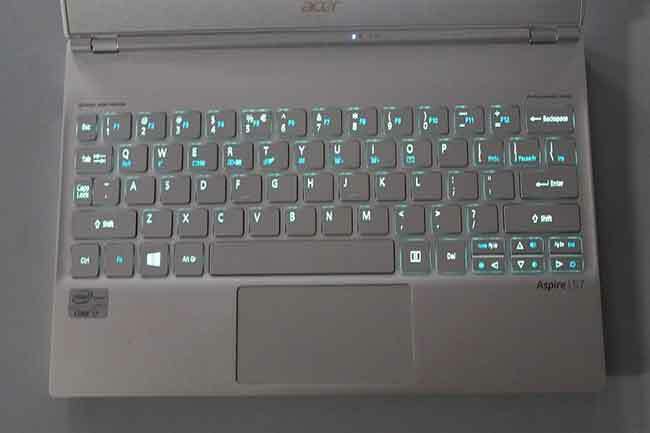 There’s little or no backlight bleed to speak of on the Acer Aspire S7’s 11-inch touchscreen display, and the overall experience in our limited time spent on the product is definitely encouraging and a sign of good things to come as far as touch-enabled Windows 8 ultrabooks, laptops or desktops are concerned. Onboard audio: The Acer Aspire S7’s onboard speakers are quite good by ultrabooks standards -- it’s mighty difficult to pack in a good audio experience in a razor thin laptop. The speakers, situated on the bottom panel near the spine of the Aspire S7 and sporting Dolby audio, pumps out loud music which is pretty good for personal entertainment. Bass is lost, but the overall clarity and quality of audio from the S7 is definitely better than most laptops we’ve reviewed in the recent past. Windows 8: We’ve been using Windows 8 throughout its Developer Preview stage on a traditional keyboard and mouse PC and we’ve had our reservations against it all along. But, the beauty of Microsoft’s latest Windows 8 operating system is truly revealed when you use it on a touchscreen device. 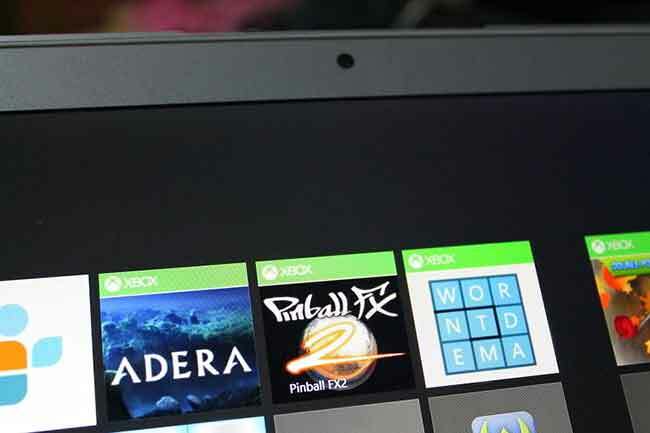 Invoking Windows 8’s “Edge UI” (launch Charms on the right edge, flip through running apps on the left edge, kill apps by swiping and dragging them down to the bottom edge of the screen, etc.) is actually quite simple to get used to through on-screen gestures. 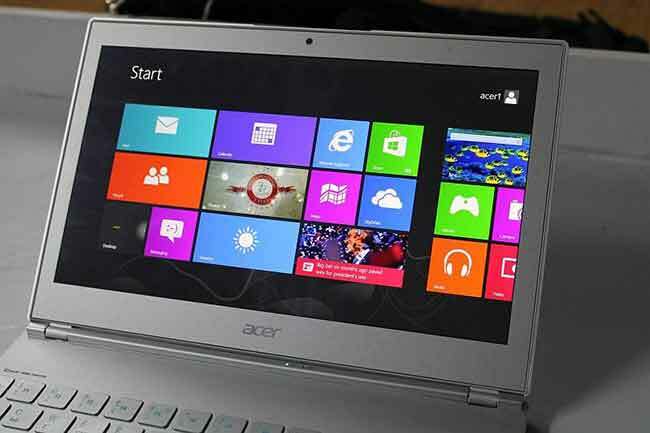 Finger taps on the Acer Aspire S7’s screen are distinctly registered and Windows 8’s response wasn’t laggy in our brief time spent on the machine. The on-screen keyboard is nice and accurate, with good word prediction -- a feature we liked on Windows Phone 7.5 -- and handwriting recognition is also good. With the touchscreen display and Windows 8’s slightly re-imagined interface, touch plays a crucial role in your overall experience of the device and Microsoft’s new operating system. 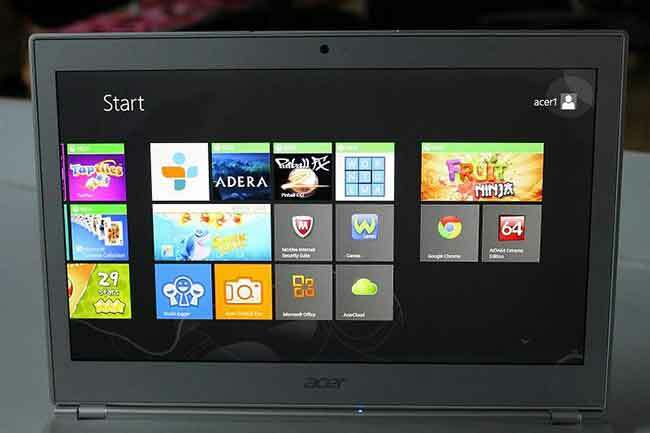 In fact, in our brief time spent on the Acer Aspire S7, we were willing to spend more time exploring the OS through the device’s 11-inch touchscreen display, then use the bundled trackpad and mouse -- we resorted to the keyboard only while requiring to type long paras of text (like this article). Stay tuned for the in-depth review...!